Mississippi is a Manufacturing State. 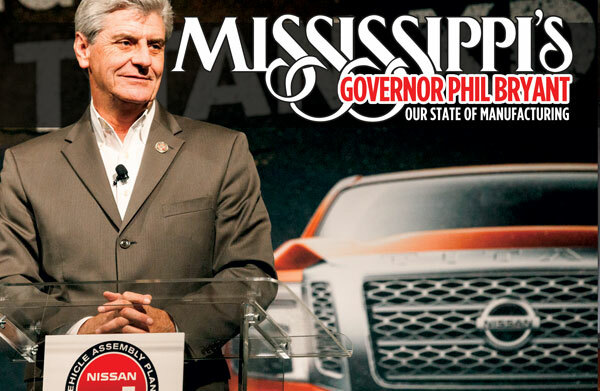 Mississippi Governor Phil Bryant encourages all manufacturers in Mississippi to join together, from the manufacturing startups to the established leaders. There is a place for all levels of manufacturing production in Mississippi. People often think of steel and metal fabrication when they think of manufacturing. However, manufacturing covers a broad spectrum of any goods produced on a large scale, with the Mississippi manufacturing base covering everything from warships to aircraft to textiles to food products. Home to manufacturers of all sizes, from giants like Ingalls Shipbuilding, Nissan, Toyota, GE Aviation, and Sanderson Farms, to smaller, homegrown operations across the state, every year Mississippi attracts new manufacturers from around the country and around the globe who undertake extensive searches before choosing Mississippi as home. Securing new manufacturing operations is extremely competitive. Other states and countries all vie to attract new business, employment opportunities, and a greater tax base. Mississippi has excelled at creating a pro-manufacturing environment that offers significant advantage to manufacturers seeking a location for operations. Each and every one of these advantages are leveraged when attracting new manufacturing business to the state. During the first quarter of 2016, Mississippi signed deals with two significant manufacturers that are an integral fit in the state’s manufacturing community — Continental Tires and TopShip. Continental Tires (Continental AG) chose Mississippi as the home of a new manufacturing plant after evaluating four countries and 11 states. The selection was made in part because they recognized Mississippi to be a leader in automobile manufacturing (Mississippi now produces around 400K vehicles per year) as well as offering a broad manufacturing base. Access to a qualified manufacturing workforce was another critical factor in their decision making. The new Mississippi location provides access to approximately 100,000 workers within a 60 mile radius of the new plant. Edison Chouest Offshore chose to locate its new shipbuilding company, TopShip, LLC, on Mississippi’s coast. TopShip will play an integral part of the Port of the Future plan that was initiated by former governor Haley Barbour and is scheduled to be completed during Governor Bryant’s term. The port, which just received three new world-class gantry cranes in March 2016, will benefit from the 1,000 jobs that TopShip expects to create in the shipbuilding facility. The state was able to make available approximately $270 million in incentives benefiting those companies to help secure those deals and ensure that those jobs and the ensuing tax base would come to Mississippi. 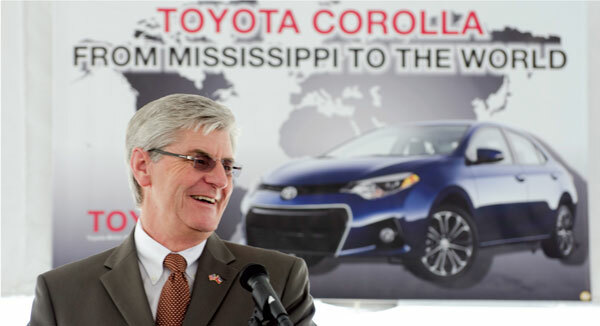 In an interview, the governor explained how Mississippi stands out as one of the best locations in the country for domestic and international manufacturers to open operations. While state-sponsored financial incentives are a fundamental attractor to potential manufacturers, workforce continues to be perhaps the most critical factor in attracting both international and state-side manufacturers. The character of the Mississippi workforce is one benefit that is attractive to potential manufacturers. Over the past decade, Mississippi has made great efforts to develop a world-class, mid-level workforce, beginning with K-12 education. 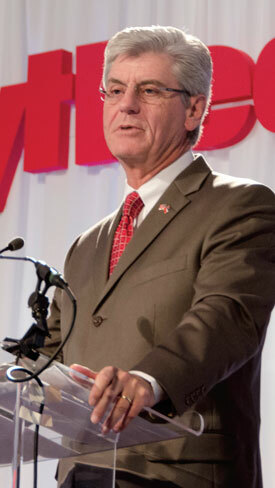 Through initiatives like the 2013 Mississippi Literacy-Based Promotion Act, which requires children to pass a test in order to move on beyond the third grade; manufacturer-co-sponsored programs in high schools, colleges, and universities; and dedicated centers of expertise, manufacturing is supported legislatively, educationally, and by the public. It is very evident that support for the manufacturing industry in Mississippi is omnipresent. Investment in the workforce pays off. The employee survey shows job growth of approximately 45,000 in the past four and a half years, primarily in manufacturing. In the first quarter of 2016, the Mississippi Development Authority already attributes 3,983 jobs created directly from private investment. The Mississippi workforce is loyal. There are uncommonly strong bonds between employees and employers that exist in Mississippi in great abundance. The governor recently visited Hunter Engineering Company in Durant, Mississippi, to help them celebrate their 40th anniversary. Hunter imports 5,000 tons of steel annually to produce heavy-duty automotive maintenance and repair equipment, including hydraulic lifts, brake lathes, wheel balancers, and alignment systems. Hunter is one example of a manufacturer that has multiple employees who have been with the company since the doors opened, in this case 40 years ago. Says Governor Bryant, “We are constantly evaluating and redefining our manufacturing efforts so that we are constantly improving and adapting to the current best practices in manufacturing.” Through state agencies and organizations, manufacturers are assisted with licensing, permitting, and other challenges faced by companies starting up. Organizations like Mississippi Manufacturers Association (MMA), Mississippi Development Authority (MDA), and Innovate Mississippi are all there to provide resources, guidance, and assistance to our manufacturing community. Governor Bryant selected Jay Moon, President and CEO of the Mississippi Manufacturers Association, to be a leader in developing strategic plans to further grow Mississippi’s skilled workforce. The Mississippi Works Fund will dedicate financial resources to growing the skilled workforce through training, job creation, and job retention. To launch the fund, the first year’s state contribution is $10 million. After year one, the plan calls for continued annual state contributions at $5 million per year. Mississippi boasts an actuarially sound Unemployment Trust Fund reserve due to 26% less demand on unemployment in 2015. Mississippi is leveraging the return on the reserve to reduce the unemployment tax for businesses and workers, and to eliminate the tax completely in two years. Employers and employees alike will celebrate the removal of that line item from their pay stubs. This is one more incentive for manufacturers and workers to choose Mississippi as a place to call home.